A common problem is plastic leaking around the nozzle. Different websites and Wikis suggest to use Teflon tape on the threads for sealing. That should not be needed if the parts are properly made. The Ultimaker nozzle and brass heater barrel that I received are very well-made. 1: The knurled drive bolt is marginal. Ultimaker recently upgraded it from V2 to V3 but I like to see an even better bolt with “proper” teeth cut instead of using a knurling tool. 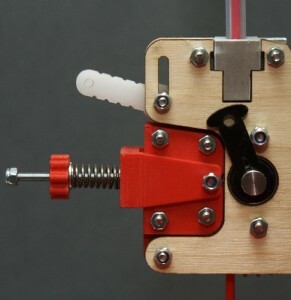 2: The filament is pressed against the bolt by a stationary piece of plastic. Although it is made from Delrin there is unnecessary friction since the force pressing the filament is rather large. 3: The position of the pressing plastic is fixed so there is drastic variation in the pressing force for slight dimensional changes of the filament. 1. Use low voltage high current heater. It is usually an etched pattern on a PCB and an external high current DC power supply. 2. Use a mains operated heater and no separate high current power supply is needed. Of course working with mains has additional risks but so does wiring a high current power supply that also needs to be connected to the mains. I obtained a boro-silicate glass plate of the correct size and since I already had 120V heating pads that can be attached by a high temperature adhesive, I attached them to a matching size aluminum plate to evenly spread the heat since glass has poor heat conduction. I added a thermocouple sensor to the glass itself and the heaters are controlled by a commercial digital PID controller that I also happened to have. After adding new mounting and leveling screws I am now very happy with that section. For accurate zeroing I added an opto-interrupter that is repeatable to a few microns, much better than the stability of the wood frame and table mounting. I have the opto set so it triggers about a mm above the table so I never need to worry about hitting the table. I have in the software turned off the limit switches and only use them for homing. Tweaking the Z value will allow fine adjustment of the table without trying to fiddle with moving microswitches around. March-2012: I was too busy to start building the printer at once but once I started it was easy to put together since the kit is well-made. The software and usage instruction were not so good but the user group support is great and I highly recommend to use the open source software for slicing and controlling the printer. The links are below. Make sure to start with the excellent Cura to make the initial learning curve as easy as possible. Personally I like full control so I do the slicing, scaling and preparation separately on my main desktop and then save the G-Code file on a server. Then I use the “Printrun” program on a dedicated small PC to run the printer. 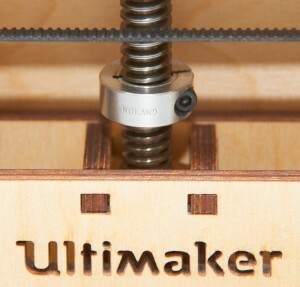 20-Dec-2011: After spending a lot of time reading on different websites I finally decided on the Ultimaker kit. It was expensive, about $2,000 with the optional Netfabb software and shipping to the USA.